This examples shows how to perform pitch tracking using multiple pitch estimations, octave and median smoothing, and a Hidden Markov Model (HMM). Pitch detection is a fundamental building block in speech processing, speech coding, and music information retrieval (MIR). In speech and speaker recognition, pitch is used as a feature in a machine learning system. For call centers, pitch is used to indicate the emotional state and gender of customers. In speech therapy, pitch is used to indicate and analyze pathologies and diagnose physical defects. In MIR, pitch is used to categorize music, for query-by-humming systems, and as a primary feature in song identification systems. Pitch detection for clean speech is mostly considered a solved problem. Pitch detection with noise and multi-pitch tracking remain difficult problems. There are many algorithms that have been extensively reported on in the literature with known trade-offs between computational cost and robustness to different types of noise. 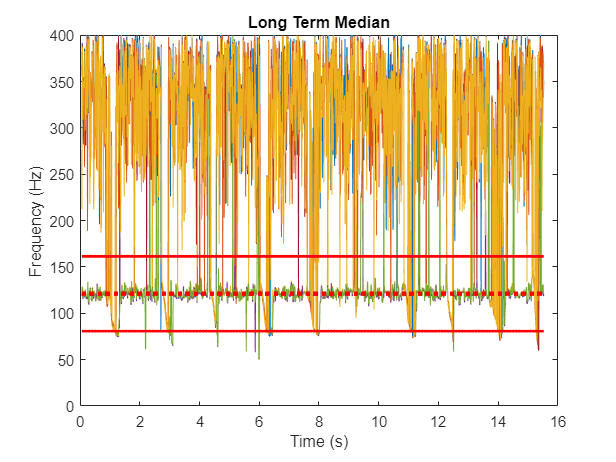 Usually, a pitch detection algorithm (PDA) estimates the pitch for a given time instant. The pitch estimate is then validated or corrected within a pitch tracking system. Pitch tracking systems enforce continuity of pitch estimates over time. This example provides an example function, HelperPitchTracker, which implements a pitch tracking system. The example walks through the algorithm implemented by the HelperPitchTracker function. Load an audio file and corresponding reference pitch for the audio file. The reference pitch is reported every 10 ms, and was determined as an average of several third-party algorithms on the clean speech file. Regions without voiced speech are represented as nan. Use the pitch function to estimate the pitch of the audio over time. Two metrics are commonly reported when defining pitch error: Gross Pitch Error (GPE) and Voicing Decision Error (VDE). Because the pitch algorithms in this example do not provide a voicing decision, only GPE is reported. GPE is calculated over the span of the known voiced segments. 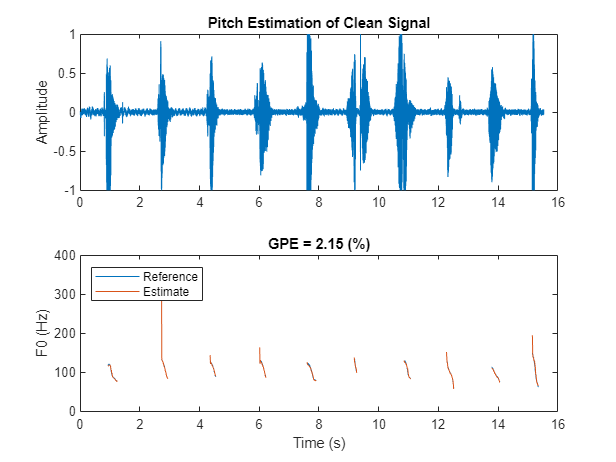 GPE is calculated as the percent of pitch estimates outside +/- 10% of the reference pitch. Calculate the GPE for regions of speech and plot the results. Listen to the clean audio signal. Mix the speech signal with noise at -5 dB SNR. Use the pitch function on the noisy audio to estimate the pitch over time. Calculate the GPE for regions of voiced speech and plot the results. Listen to the noisy audio signal. 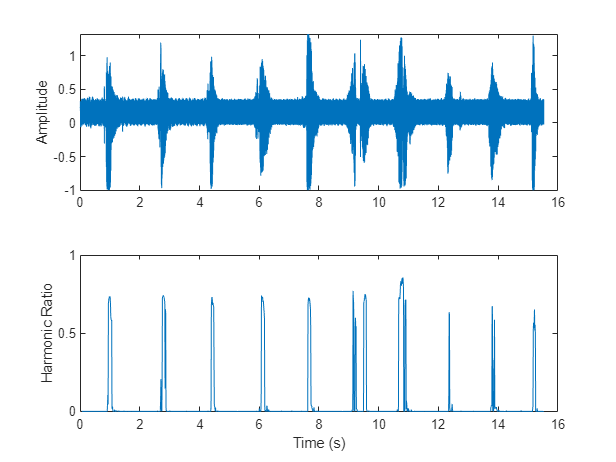 This example shows how to improve the pitch estimation of noisy speech signals using multiple pitch candidate generation, octave-smoothing, median-smoothing, and a Hidden Markov Model. The algorithm described in this example is implemented in the example function HelperPitchTracker. To learn about the HelperPitchTracker function, enter help HelperPitchTracker at the command line. return an estimate of the fundamental frequency. of samples in each hop. The pitch esitmate is updated every hop. unspecified, TF defaults to true. the center of the analysis frames. associated with each pitch decision. The graphic provides an overview of the pitch tracking system implemented in the example function. The following code walks through the internal workings of the HelperPitchTracker example function. In the first stage of the pitch tracking system, you generate multiple pitch candidates using multiple pitch detection algorithms. The primary pitch candidates, the ones we "trust" more, are generated using algorithms based on the Summation of Residual Harmonics (SRH)  algorithm and the Pitch Estimation Filter with Amplitude Compression (PEFAC)  algorithm. Buffer the noisy input signal into overlapped frames, and then use audio.internal.pitch.SRH to generate 5 pitch candidates for each hop. Also return the relative confidence of each pitch candidate. Plot the results. Generate an additional set of primary pitch candidates and associated confidence using the PEF algorithm. Generate backup candidates and associated confidences using the normalized correlation function (NCF) algorithm and cepstrum pitch determination (CEP) algorithm. Log only the most confident estimate from the backup candidates. The long-term median of the pitch candidates is used to reduce the number of pitch candidates. To calculate the long-term median pitch, first calculate the harmonic ratio. Pitch estimates are only valid in regions of voiced speech, where the harmonic ratio is high. Use the harmonic ratio to threshold out regions that do not include voiced speech in the long-term median calculation. After determining the long-term median, calculate reasonable lower and upper bounds for pitch candidates. Candidates outside of these bounds are penalized in the following stage. By default, candidates returned by the pitch detection algorithm are sorted in descending order of confidence. Decrease the confidence of any primary candidate outside the lower and upper bounds. Decrease the confidence by a factor of 10. Re-sort the candidates for both the PEF and SRH algorithms such that so they are in descending order of confidence. Concatenate the candidates, keeping only the two most confident candidates from each algorithm. 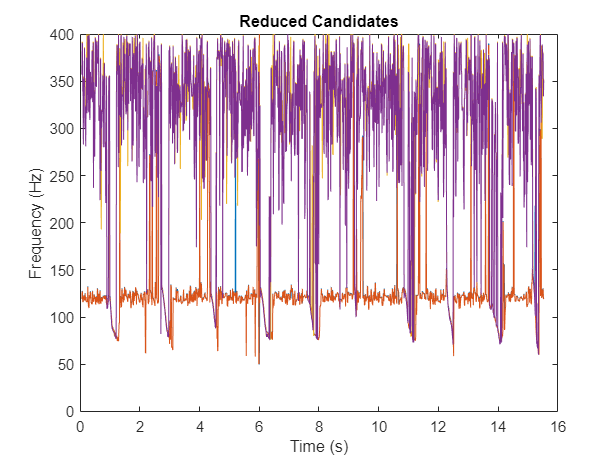 If two or more candidates are within a given 5 Hz span, set the candidates to their mean and sum their confidence. Load the emission matrix and associated range. 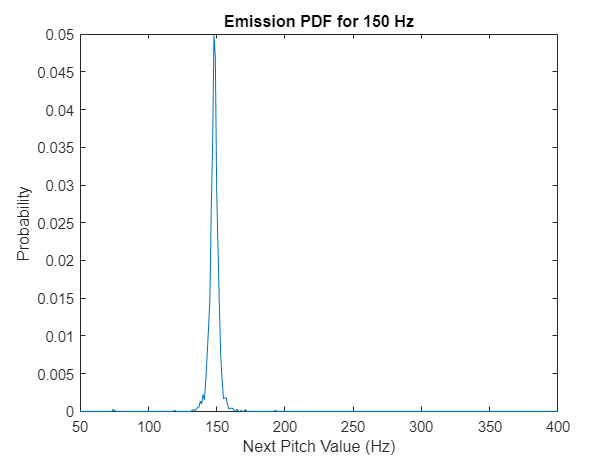 Plot the probability density function (pdf) of a pitch in 150 Hz state. The HMM used in this example combines the emission probabilities, which enforce continuity, and the relative confidence of the pitch. At each hop, the emission probabilities are combined with the relative confidence to create a confidence matrix. A best choice for each path is determined as the max of the confidence matrix. The HMM used in this example also assumes that only one path can be assigned to a given state (an assumption of the Viterbi algorithm). In addition to the HMM, this example monitors for octave jumps relative to the short-term median of the pitch paths. If an octave jump is detected, then the backup pitch candidates are added as options for the HMM. 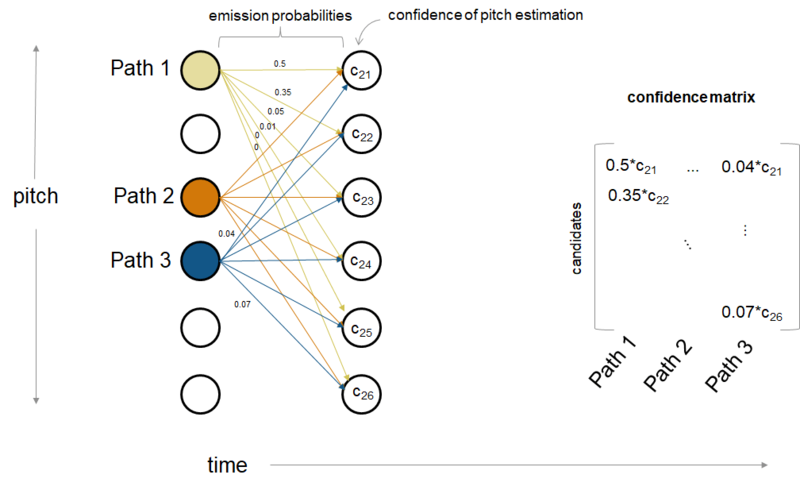 % pitch determination algorithms as potential candidates. Once the forward iteration of the HMM is complete, the final pitch contour is chosen as the most confident path. Walk backward through the log book to determine the pitch contour output by the HMM. Calculate the GPE and plot the new pitch contour and the known contour. As a final post-processing step, apply a moving median filter with a window length of three hops. Calculate the final GPE and plot the final pitch contour and the known contour. The HelperPitchTracker function uses a Hidden Markov Model to apply continuity constraints to pitch contours. The emission matrix of the Hidden Markov Model can be set directly. It is best to train the emission matrix on sound sources similar to the ones you want to track. Download the dataset from https://www.spsc.tugraz.at/tools/ptdb-tug files. Set datafolder to the location of the data. Create an audio datastore that points to the microphone recordings in the database. Set the label associated with each file to the location of the associated known pitch file. The dataset contains recordings of 10 female and 10 male speakers. Use subset to isolate the 10th female and male speakers. You will train an emission matrix based on the reference pitch contours for both male and female speakers 1 through 9. The emission matrix describes the probability of going from one pitch state to another. In the following step, you create an emission matrix based on speakers 1-9 for both male and female. The database stores reference pitch values, short-term energy, and additional information in the text files with files extension f0. The getReferencePitch function reads in the pitch values if the short term energy is above a threshold. The threshold was determined empirically in listening tests. The HelperUpdateEmisionMatrix creates a 2-dimensionsal histogram based on the current pitch state and the next pitch state. After the histogram is created, it is normalized to create an emission matrix. Define different types of background noise: white, ambiance, engine, jet, and street. Resample them to 16 kHz, to help speed up testing the database. Define the SNR to test, in dB, as 10, 5, 0, -5, and -10. Run the pitch detection algorithm for each SNR and noise type for each file. Calculate the average GPE across speech files. 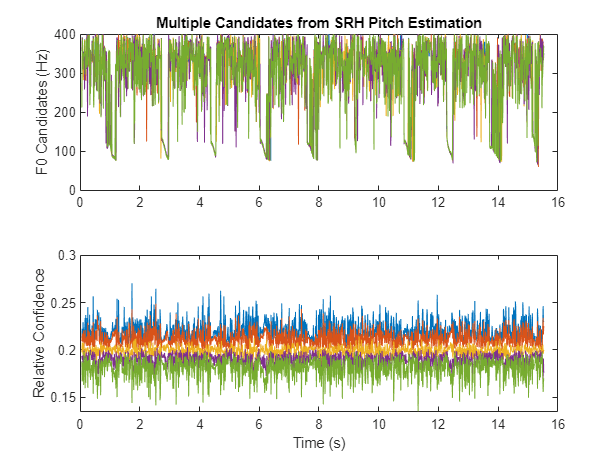 This example compares performance with other popular pitch tracking algorithms: Summation of Residual Harmonics (SRH), Sawtooth Waveform Inspired Pitch Estimator (SWIPE) and Pitch Estimation Filter with Amplitude Compression (PEFAC). MATLAB® implementations of all three algorithms can be found at , , and . 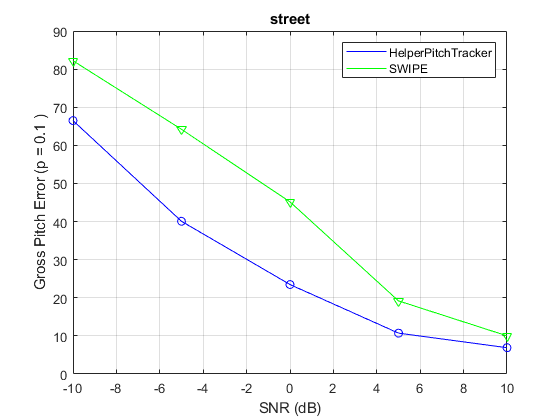 The HelperPitchTracker function uses parts of the SRH and PEFAC algorithms, as described in  and , internally. To run this example without comparing to other algorithms, set compare to false. On the machine this example runs on, the following comparison takes around 30 minutes. f0 = [0;f0];%#ok<AGROW> % manual alignment with database. f0 = f0(3:end);% manual alignment with database. % Plot the gross pitch error for each noise type. 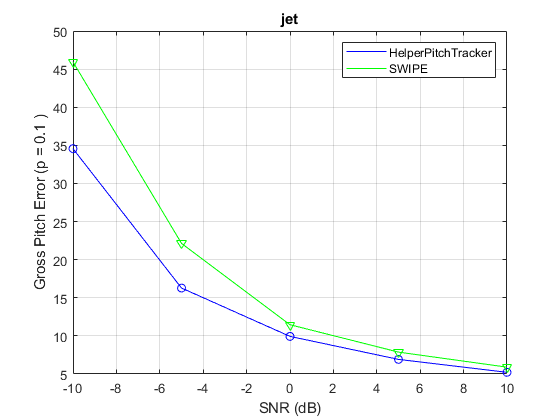 You can use HelperPitchTracker as a baseline for evaluating GPE performance of your pitch tracking system, or adapt this example to your application. G. Pirker, M. Wohlmayr, S. Petrik, and F. Pernkopf, "A Pitch Tracking Corpus with Evaluation on Multipitch Tracking Scenario", Interspeech, pp. 1509-1512, 2011. Drugman, Thomas, and Abeer Alwan. "Joint Robust Voicing Detection and Pitch Estimation Based on Residual Harmonics." Proceedings of the Annual Conference of the International Speech Communication Association, INTERSPEECH. 2011, pp. 1973-1976. Gonzalez, Sira, and Mike Brookes. 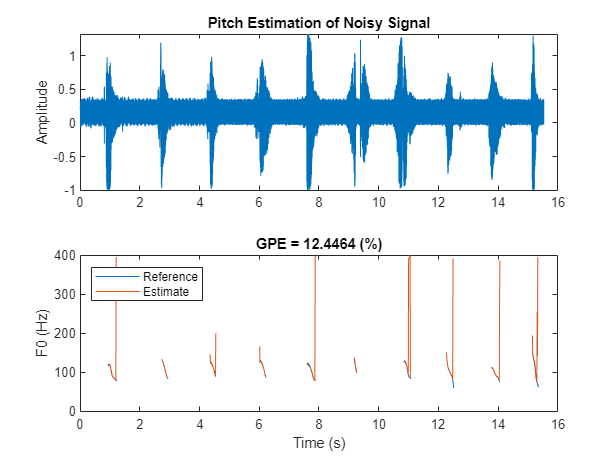 "A Pitch Estimation Filter robust to high levels of noise (PEFAC)." 19th European Signal Processing Conference. Barcelona, 2011, pp. 451-455. Signal Processing and Speech Communication Laboratory. Accessed September 26, 2018. https://www.spsc.tugraz.at/tools/ptdb-tug. "Arturo Camacho." Accessed September 26, 2018. https://www.cise.ufl.edu/~acamacho/english/. "Fxpefac." Description of Fxpefac. Accessed September 26, 2018. https://www.ee.ic.ac.uk/hp/staff/dmb/voicebox/doc/voicebox/fxpefac.html. Thomas Drugman's Homepage. Accessed September 26, 2018. https://tcts.fpms.ac.be/~drugman/Toolbox/.